There are some words in the English language (and I'm sure other languages as well, but this is the one I speak fluently and know the best) which carry a particular connotation. This is something which I find rather regrettable as I think words that are not meant to be derogatory should be able to retain their neutrality and be seen as purely descriptive. I'm not talkinga bout words like "bonehead", which is clearly meant as an insult, or even things like "stupid". The type of word I'm talking about is something like "fat". This word actually is an adjective, but it's also used as an insult because being fat is seen as such a crime against humanity in our current age. Of course, it's only derogatory when we're talking about humans. If we're talking about cats, it can just be considered incredibly cute and cuddly. At least I love big fat kitties. While "fat" is seen as having a derogatory connotation, "petit" is seen as having a fairly positive one. In fact, unless we're talking about men, I'm pretty sure petit is always seen as being a good thing. For women, shopping in the petit section is seen as an achievement. Petit animals - the sort that yap and crap everywhere - are somehow seen as adorable no matter how inbred and lacking in brain power they seem to be. When it comes to snacks, I'm not sure of the connotation and it's interesting to note that there's a line of "petit" snacks in Japan and the French have their "petit fours", but America has "super sizing" and "Big Gulps". If anyone knows a line of "petit" snacks in the U.S., I'd like to hear about it. Mostly, I'm seeing "giant" this and that. Though, to be fair, there are "Giant Pocky" in Japan. At any rate, I'm not so sure that "petit" branding would sell in the U.S. as it does in Japan as we seem to like our women tiny, but not our food. That's a rather odd contradiction as big food makes it harder to have petit people. As is always the case with the "petit" brand, these are tiny little cookies. Each is about the diameter of a 5-yen coin or a nickel. That's a little bigger than your thumbnail if you're me. The calorie count is 16 each. That sounds pretty demure until you consider that you could easily put away half of the package in one sitting if you weren't being careful. Each cookie is cripsy and has a shortbread-like texture. 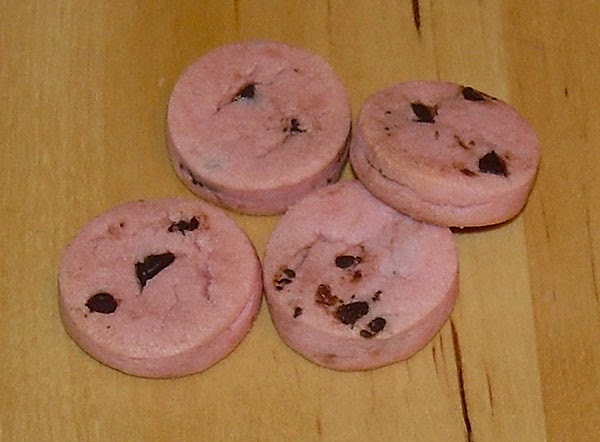 You get hit by a burst of bittersweet chocolate chips coupled with a light strawberry flavor. The strawberry elements works far, far better than I would have imagined because it is not overly acidic nor floral. It sits in the background adding depth without clashing with the chocolate chip titans. The texture of this is amazingly satisfying and this was a far better little cookie than I could have guessed. In fact, I loved it and no one is more surprised than I am that that was the case. I expected this to be very "meh", but this is a definite strong "happy". At $1 (about 100 yen) per package, I would definitely buy these again.